In a season that has seen as much detraction as praise, the Golden State Warriors had another chance on April 13—the last game of the regular season—to silence critics and break the ’95–96 Chicago Bulls NBA record for most wins in a season. They did just that with a 125–104 win over the Memphis Grizzlies to become the first team to ever win 73. Stephen Curry finished with a team high of 46 points, shooting 15-for-24 from the field, with 10 of those shots coming from behind the arc. Curry finished the regular season with 402 three-pointers, an accomplishment no player has ever done before in a single season. He held the previous record for three pointers in a season with 286, which he set last year. The reigning MVP is also the first player since Michael Jordan (in the 1991-1992 season) to shoot 50 percent from the field and average 30 points per game. Jordan, who led the ’95-’96 Chicago Bulls to a 72–10 record, offered his congratulations to the new record-holders. The first round of the playoffs begin when the Golden State Warriors take on the Houston Rockets at the Oracle Arena on April 16. For now, the Golden State Warriors are soaking in the historic moment, a moment Jordan wanted the team to have—according to Draymond Green. Green finished with 11 points and nine rebounds, and had been extremely vocal about wanting to make history. He is glad to have done so. One half of the “Splash Brothers” Klay Thompson (the other half is Steph Curry) added 14 points, while Harrison Barnes dropped in 15 points for the Warriors. 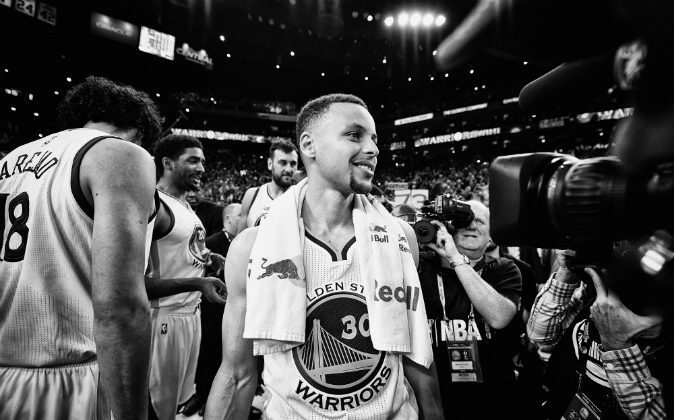 “It’s a great way to finish off what was an amazing regular season,” Coach Steve Kerr said. “I just told our guys I never in a million years would have guessed that that record would ever be broken.” Kerr, ironically was a player on the ’95–96 Chicago Bulls team. “I thought it was like DiMaggio’s hit streak, really. I was wrong, but I will say the same thing now that I said 20 years ago, `I don’t think this one will ever be broken.’ Somebody’s got to go 74–8. I don’t see it, and I hope our fans aren’t expecting that next year,” Kerr said.